April 4, 2011 - On Saturday morning a Gulfstream G650 was undergoing flight takeoff-performance tests in Roswell, New Mexico, crashed killing all four Gulfstream employees. Two pilots and two flight-test engineers. The Gulfstream G650 is a twin-engine business jet aircraft under development by Gulfstream Aerospace. Gulfstream began the G650 program in 2005 and revealed it to the public in 2008. The G650 is the company's largest and fastest business jet. At about 9:30 AM the Gulfstream G650 began its departure from Roswell International Air Center Airport, as the aircraft rotated for take off the right wingtip clip the ground. The aircraft briefly become airborne, the pilot tried to land the aircraft, that's when when the landing gear collapsed and the aircraft skidding down the runway. The Gulfstream G650 crashed and burst into fames at the end of the runway. 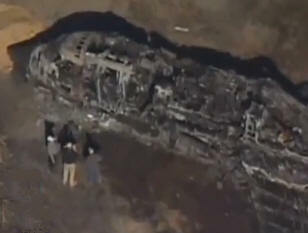 On Sunday Gulfstream Aerospace Corp. identified the four employees killed in the crash. Experimental test pilots Kent Crenshaw and Vivan Ragusa and technical specialists David McCollum and Reece Ollenburg died in the accident. All four were residents of Savannah. "We mourn the loss of our colleagues and friends and extend our deepest sympathies to their families," said Joe Lombardo, president, Gulfstream. "The Gulfstream team has already rallied to support the people these men left behind, and we know that the local and aviation communities will do the same. On their behalf, we ask for your kindness, support and understanding as they, and the rest of the Gulfstream family, grieve the passing of these fine professionals." Crenshaw, 64, joined Gulfstream in August 1997. He leaves behind a wife and adult son. Ollenburg, 48, had been with Gulfstream since June 2009. He is survived by his wife and three children. Ragusa, 51, was hired at Gulfstream in 2007. He is survived by his wife and three children. McCollum, 47, who started working at Gulfstream in 2006, is survived by his parents. Flight tests on the Gulfstream G650 began in late 2009, joint certification from the US Federal Aviation Administration and the European Aviation Safety Agency is being pursued and expected to be completed during 2011. Customer deliveries are expected to begin in 2012.